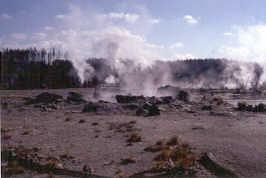 Porkchop Geyser is a geothermal feature located in the Back Basin of Norris Geyser Basin. The National Parks Service deemed it important enough to give it its own little stretch of boardwalk and interpretative signing! The remains of this feature bears witness to the explosive potential of the water erupting from the subsurface. All of the photographs on this page were taken from an off boardwalk position with Park Ranger permission. This photograph was taken looking back towards the boardwalk and across the gently steaming pool of Porkchop. We were able to examine this feature in close detail as we had guidance from Ranger Bill Wise, as well as the necessary research permit. In this photograph, one of my colleagues Steve Fayers, is collecting data on the temperature and pH of the pool waters of Porkchop Geyser. Close to the vent and Pool of Porkchop, the milky water colour can be observed. This is due to the high dissolved silica content. 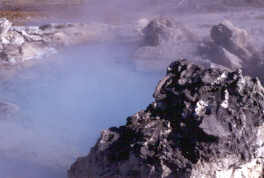 The large rock in the foreground is part of the geyser vent structure blown out when Porkchop suffered a hydrothermal explosion on September 5th 1989.